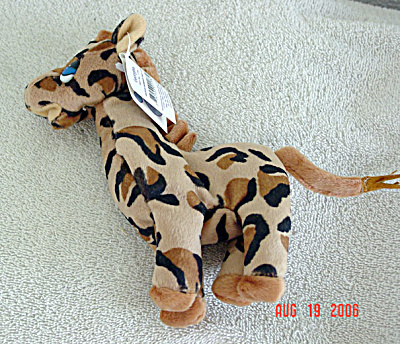 Precious Moments Company golden tan and brown Georgiana Giraffe from the First Edition of Bean Bag Pals (originally called 'Beanie Pals') that were first produced in 1997 and retired in April,1998. Her tag's verse says: 'Georgiana the Giraffe Covered in spots, Stands so tall and smiles a lot!' Georgiana has stick-on teardrop shaped eyes and is comparable size to Ty beanie babies and the small Enesco Tender Tails at approximately 7 to 8 inches in size. New and mint, has her tag.